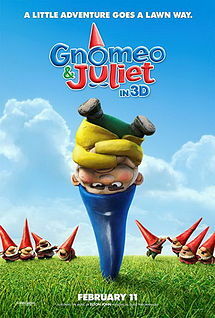 Gnomeo &amp; Juliet is a 2011 animated fantasy film based on William Shakespeare's play Romeo and Juliet. The film is directed by Kelly Asbury, and the two main characters are voiced by James McAvoy and Emily Blunt. The film was released on February 11, 2011.